We first started shooting one succesful day at the kicker, and then bad weather moved in for some days. We headed back again to wrap up the filming for "Eyes Wide Open" with RED, helicopter and the same great line up of skiers. Jon and the Norwegian skiers got more and more comfortable with the jump as the days went by. They improvised with big technical tricks, with more height and airtime that never have been seen before. Jon had been racing gates 14 days in a row before hitting the jump, but that did not effect his jumping skills. He stepped it up with new grab combos on his double flips, and big stylish spins. Then it was time for the big helicopter day. We were all psyched to get some really good shots that will raise the quality of the movie. It turned out great, even if the Cineflex gyro stabilzator we supposed to use on the helicopter didn´t work that day. Filip had to film handheld with the RED One camera, and he got the shots. The day after, Tom Wallisch came to Juvass for coaching the Quiksilver camp, as well as film for "Eyes Wide Open". We sessioned the jump for a bit, and Tom got some nice footage together with the Norwegians. This was a perfect way to end the filming for "Eyes Wide Open". Now its time to edit the whole movie together, which will take a while. Be sure to check it out this fall. The modern movement in skiing is progressing more than ever, and it is hard to keep up with the stream. Field Productions has gathered skiers with all different backgrounds , but they all share the same vision about skiing. 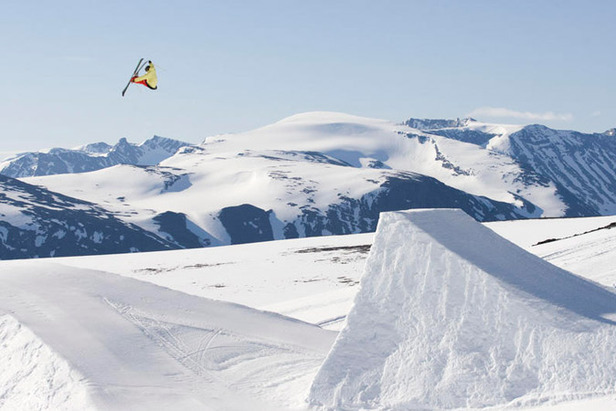 Yes, skiing is about taking risks to invent new tricks and styles, but most importantly to have fun. "Eyes Wide Open" gives you both. The movie includes top notch skiing in deep powder, big mountains, city streets and terrain parks featuring many of the most talented athletes out there. Look out for many unseen rail combos by Tom Wallisch and Even Sigstad, bottomless powder at Mica Heli with Åsmund Thorsen and Eric Hjorleifson, epic park heli shoots on the most beatiful places in Norway, JT Holmes and Eirk Finseth charging Lake Tahoe, Norwegian invasion in Montafon Austria and much, much more. Some parts of the movie is filmed with the RED One camera, which gives ski movies a whole new meaning. The movie will be sold as a 2-disc set, together with the "Eyes Wide Open Documentary." The documentary gives you a deeper insight of the 2009 season, as well as the athletes' thoughts and explanations of each aspect in skiing. Video from Juvass 2008 with Alexander Aurdal, Christopher Helberg and Kim Hellebust.